LSI Logic has joined the Yocto Project. As a Gold member organization, LSI will participate in the project's governance and exchange code, as all member organizations do. The Yocto Project welcomes LSI to the Yocto Project family! The kernel.org sync is not quite complete, but should finish in the next few hours. Congratulations to everyone for a successful release! Criticism can be hard to hear, particularly when you care about something a lot. But if you can be open to it, it's important to hear, particularly unsolicited, honest feedback. I really appreciate a talk Chris Simmonds gave in October 2012 in Barcelona at the Embedded Linux Conference - Europe. In it, he listed out the major requirements he has as an embedded Linux consultant. Then he ranked three different approaches using these requirements: Android, Traditional Linux Distributions, and the Yocto Project / Open Embedded. Yocto Project 1.4 (dylan) will be coming out with a new package manager, dumping zypper for smart package manager. Smart is written in python, and has nicer transactions when doing upgrades which does not leave the system in unrecoverable state if anything goes wrong with an update. Last week, we held our third Yocto 'Developer Day', this time with a slightly different format that I thought worked out pretty well in a number of ways. One big change was that we cut the session down to a half-day instead of the full day we'd done in the past, and as a consequence were able to dispense with the hands-on lab sessions. In the past, we'd actually brought in a bunch of desktop machines and had users walk through printed lab sessions on those machines. We also brought in an equal number of embedded boards for users to play around with as part of the labs. On February 20, 2013, I was honored with the chance to give a keynote at the Embedded Linux Conference in San Francisco. These are some notes and URLs which back up my comments in the talk. My first experience with open source operating ssytems was around 1980 when I was in college. At Colorado State University, the entire Computer Science Department ran on a single DEC VAX 11/750. That little Vax 750 was running 4.2 BSD Unix and had 12M of memory. A 32 bit system connected (by UUCP) to the rest of the "network" as it was then. Yocto Project Developer Day begins tomorrow, with five presentations and a one-on-one session with Yocto Project developers. Unfortunately, registrations are now closed thanks to overwhelming interest. For those attending, please arrive a little bit early to register and check the schedule. Over the years I have tended to specialize in a particularly focused areas of development. Until recently, this has primarily been in locking and scheduling, particularly with respect to multiprocessing and real-time. Since I have joined Intel and been working on the Yocto Project, I have had to branch out quite a bit. The conference season starts early this year with several open source conferences worldwide, including FOSDEM in Brussels, linux.conf.au in Canberra, several regional Linux conferences including SCaLE in southern California, and of course the Embedded Linux Conference (ELC), February 20-22 in San Francisco, CA. 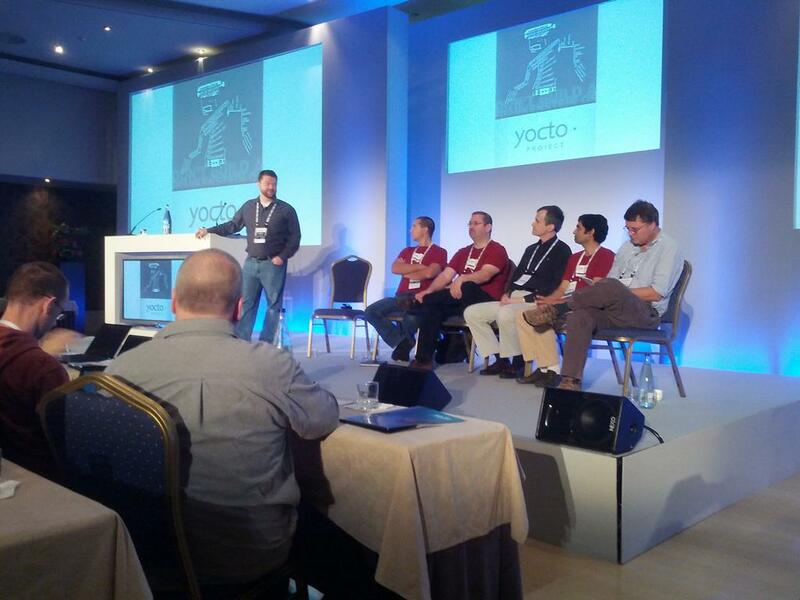 The Yocto Project held its 2nd Developer Day today, following the Embedded Linux Conference Europe & LinuxCon Europe at the Hotel Fira Palace in Barcelona, Spain. Developer Day is a free day-long event that provides presentations and hands-on lab training for both new and advanced users. Today, over 100 people used this opportunity to learn more about the Yocto Project and its role in the embedded Linux ecosystem.